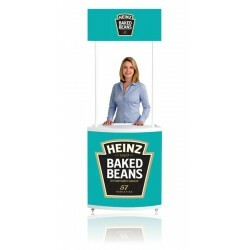 Cylindrical reception counter This counter is created for the open stands and to supply a visual impact in 360 degrees during your exhibitions, shows and fairs.Delivered in its bag for a practical transport!Offered printing! 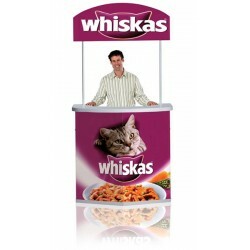 Convex and discount reception counter This counter was created to be quickly mounted to welcome prospects / customers during show, fair or exhibition. 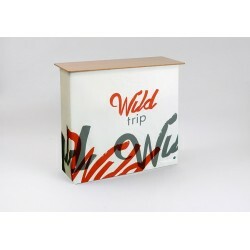 Delivered in its bag for a practical transport!Offered printing!Offered delivery! 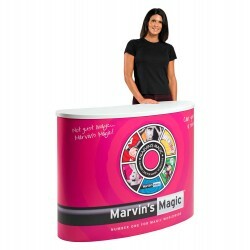 Rectangular pop up counter This rectangle shaped counter is designed for quick and easy mounting and will draw attention to your stand with a tremendous visual impact. Delivered in a bag for convenient transportation ! 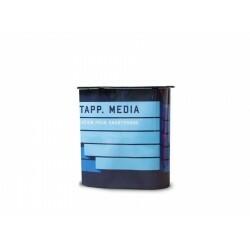 Free Printing ! 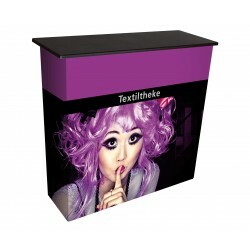 Counter: discount reception desk This counter was created to be quickly ready to welcome prospects / customers during any type of show, fair or exhibition.Size: 93 x 130 x 50 cmsDelivered in its bag for a practical transport!Offered printing!Offered delivery! 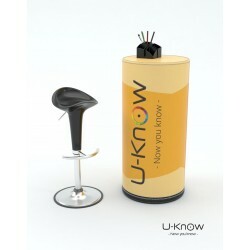 Aluminum counter with Velcro attachment This aluminum counter with Velcro attachments is very easy to install and to defuse. Its picture is fixed thanks to Velcro strips and is thus easy to remove. This counter is very multi-purpose. 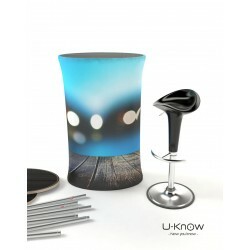 Size: 96 x 41 x 92 cmFast delivery!Printing included!Easy to install! 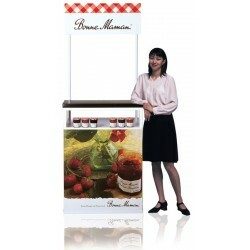 Reception PVC counter This PVC reception counter is perfect for any event or show taking place indoor. 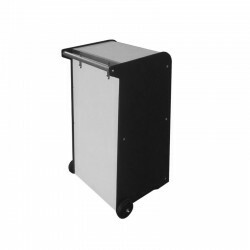 It possesses an unbeatable value for money!Size: 90 x 45 x 94 cmWeight: 17 kg Fast delivery!Printing included!Easy mounting and transport! 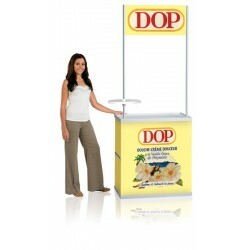 Counter with sign This fast assembly counter will allow you to promote your company effectively and inexpensively. Delivered in a bag for convenient transportation ! Free Printing ! 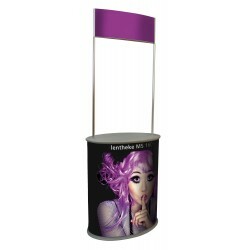 Stretch reception bar with aluminium structure This stretch reception bar is reinforced by an aluminium structure, and will be perfect on your stand as a reception counter. 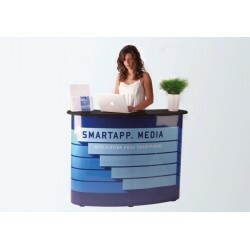 Circular reception counter This counter is designed to welcome your prospects / customers from all sides. 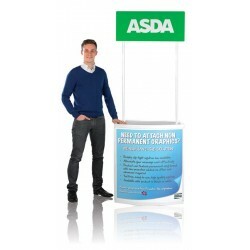 Furthermore it supplies an impressing visual impact on your stand.Delivered in its bag for a practical transport!Offered printing!Offered delivery! 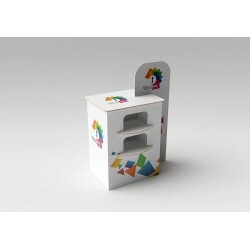 Pop up circular counter This foldable counter is intended for a fast assembly. 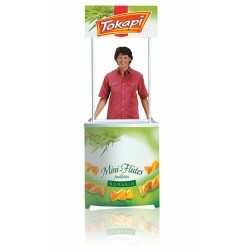 Indeed, in a few minutes you can set it up and provide an immediate visual impact ! Delivered in a bag for convenient transportation ! Free Printing ! 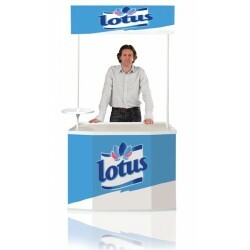 Foldable rectangular reception counter with fast opening This foldable counter is designed for a fast assembly: just unfold it to set it up and supply an immediate visual impact!Delivered in its bag for a practical transport!Offered printing!Offered delivery! 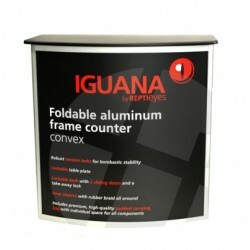 Secure foldable counter, aluminium frame This counter was designed to help you to organize your fairs or exhibitions, conveniently and with complete safety. 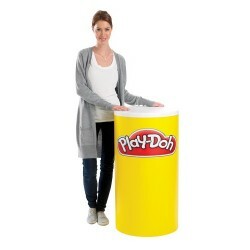 Delivered in a bag for convenient transportation ! Free Printing !